Singapore is Part 2 of reflections of our travels this past late Autumn 2010 – as you probably know by now, during the past three months I’ve presented the Greenroofs.com “2010 Top 10 List of Hot Trends in Greenroof & Greenwall Design” in Mexico City, Singapore, and most recently Vancouver, B.C. Singapore (Singapura in Malay) is officially the Republic of Singapore, a gorgeous island country off the southern tip of the Malay Peninsula in Southeast Asia. Although only about 600 sq km in size, Singapore is the world’s fourth leading financial center and its port is one of the five busiest in the world, playing a key role in international trade and finance. Due to its prime location at the Equator, with its climate of perpetual summer and high rainfall, Singapore offers a rich diversity of flora and fauna, and influences from a multi-ethnic society make dining, shopping, and entertainment top draws, too. Interestingly, it’s also known as The Lion City, although it is not believed that these animals ever lived on the island. The inaugural International Skyrise Greenery Conference was held here from November 1 -3, 2010, but we stayed for about 7 days – hey, if you’re going to travel half-way around the world, you may as well stay a while and see as many sights as you can! This was before getting stuck in Narita, Japan, one night on our trek – that’s another story. But we made the best of it, and since we had been there before, we ended up eating at a Chinese restaurant in our hotel by the airport (go figure). The International Skyrise Greenery Conference organizers were CUGE (The Centre for Urban Greenery and Ecology), a project of the National Parks Board of Singapore (NParks), and the International Green Roof Association (IGRA). This 3-day international conference focused on the latest technological developments and new areas of application in the field of greenroofs and vertical greenery. Greenroofs.com was a Media Sponsor, and participants were able to receive a huge discount through us! We feel they did a fantastic job all around. I’m not sure of the attendance numbers, but I would estimate around 550-600 people, with a large (and very friendly) contingent from China – about 75 delegates. We met folks from all over including many lovely Chinese professionals – plus delegates from the U.S., Canada, Puerto Rico, Australia, New Zealand, Germany, The Netherlands, Italy, the UK, Malaysia, Hong Kong, Saudi Arabia, Belgium, The Philippines, Indonesia, Denmark, India, Iran, Macau, and probably more! All the speakers here were awesome, too, and the projects on the tours were simply over the top! No, really. Check out the simply amazing SkyPark at Marina Bay Sands below – the one hectare Sky Park covers three 55-story hotel towers and cantilevers 65 meters over the edge. Yes, this is a graphic below, but it really looks like this! I did take the photo below it. I’m not trying to compare any other conference city to Singapore – it would be unfair to all other locales and simply impossible to compare cities apples to apples, let alone top it. We’ve never seen a cleaner and greener city in all our travels – even Roland Appl of ZinCo, who lives in the beautiful green Stuttgart area, was flabbergasted (sorry, it’s the only word that describes it) at the sheer amount of greenery and detail to greening practices. Did you know that every tree in Singapore is tagged with a microchip to account for maintenance practices, and it’s a misdemeanor to trim a tree without city permission, let alone cut one down? Of course it may have to do with local politics…they take their trees and urban greenery very seriously here. And there certainly appears to be no economic slowdown here, either. There was construction at every turn, and it seemed like each building was designed to be a stand-out, iconic structure, too. Not surprisingly, Singapore claimed the title of fastest-growing economy in the world last year, with GDP growth of 17.9% in the first half of 2010! In any case, skyscrapers and sky gardens reign here ~ about 90-95% of people live in high rise buildings (mostly public housing blocks) on this small island city-state nation, so it’s no wonder that a government so dedicated to greening practices wants to provide its citizens with as much nature within a tight city as possible. 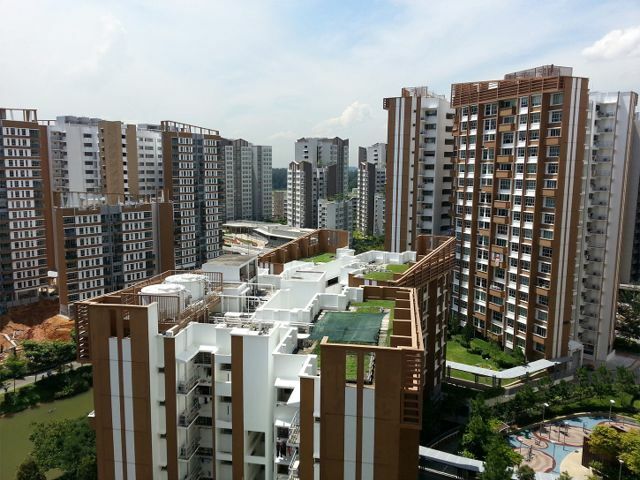 Singaporeans are lucky to have the support of the government, who introduced the Green Roof Incentive Scheme in 2009 to encourage owners of existing buildings to green their rooftops, among other measures. The three-year program offers a cash grant equal to 50% of actual installation costs, subject to a maximum of $75 (Singapore) per square-meter of planted area. Additional incentives include the Urban Redevelopment Authority’s (URA) LUSH (Landscaping for Urban Spaces and High Rises) which consists of four parts – Landscape Replacement Policy for Strategic Areas; Outdoor Refreshment Area on Landscaped Roof tops; GFA Exemption for Communal Sky Terraces; and Landscaped Deck. This program was designed to consolidate and synergize a number of new and existing green initiatives. And the BCA Green Mark Certification and Incentive Scheme, launched in January 2005, is an initiative to drive Singapore’s construction industry towards more environment-friendly buildings. Several points in the scoring system can be achieved by installing greenroofs and greenwalls. Getting back to the International Skyrise Greenery Conference, to be honest, everything about it was top-notch and highly impressive. Our hotel was the beautiful Carlton Hotel Singapore, above, which was about a 4-minute walk away from the venue. Held at the National Library of Singapore, below,the beautiful structure was designed by renown green architect-planner, ecologist and author Dr. Ken Yeang, of Llewlyn Davies Yeang, UK. In 2005, this project received the BCA Green Platinum Award for its green-accredited tower design. It’s an innovative green building designed using bioclimatic design techniques perfectly suited to the tropics, with extensive landscaping and sky gardens. It was pretty cool how they set everything up to fully enjoy the site – the Exhibition Hall was open air, set on the ground floor Level 1, The Plaza, which was warm but comfortable since it captured the balmy pass-through breezes due to the design of the wide spaces and high ceilings. We also had the lunches and tea breaks here, too. I have to say that the food and refreshments were outstanding! “In today’s context of rapid urbanisation, 70% of the world’s population is expected to live in cities by the year 2050. Cities will increasingly face competing uses of land, and it will be challenging to set aside sufficient land for parks and greenery. SIA-NParks (Singapore Institute of Architects and National Parks Board) then presented the winners of their third annual Skyrise Greenery Awards 2010, which aims to promote and recognize the greening of high-rise developments – to encourage creative and original ideas and to highlight the importance of team effort in their design, implementation, and maintenance. There were some pretty cool projects featured here – three projects received first, second, and third prizes for Completed Projects, and one received the first prize for Unbuilt Projects/Ideas. I was honored to follow them with our Top 10 List, and then we heard from Roland Appl, President of the International Green Roof Association (and ZinCo Technical Director) who shared “The Development of Green Roofs – A Look Behind the Scenes.” Afterwards the program broke out into three parallel workshops – so Aramis and I divided. On the second day, Tuesday, November 2, we were enlightened by keynote speaker Argentine-born U.S architect (and my personal favorite) Emilio Ambasz, below, and his reflections of “Architecture and Nature – Towards a Pact of Reconciliation.” He spoke about his design philosophy over 35 years of experience designing “to integrate architecture into design,” making it accessible to all and to be used by the community at large. He also showed his firm’s film “Green Over the Grey” which is the story of designing a building in the middle of a garden where 100% of the disturbed ground plane is recovered with green – where “the House AND the Garden” are organically integrated. “People should be their own gardeners,” Emilio says. Our fourth keynote, Malaysian born architect Dr. Ken Yeang, below, followed with “Vertical Greenery and Urban Water Management.” He explained the need to create an ecological nexus between species and architecture, and spoke about the current Solaris project in Singapore, which among other features will contain the longest linear park at 1.3 km in the world when completed. Each wowed us with their very unique personalities and distinct presentation styles! For example, Mr. Ambasz said, “Architecture is a state of spirit, not diplomas,” and Dr. Yeang said, “A green building should look green, which means hairy!” Since Day 2 offered an entire plenary session, no choosing of sessions was necessary. We made lots of new friends here, including Italian agronomist and green designer Laura Gatti from Studio Laura Gatti, seated below,with us. The French red and white wine selection was fabulous, and since it was rather hot in the tropical rain forest climate, Aramis and I were very happy to sip on the white wine all evening. We appreciated it even more afterwords! Side Note: We had arrived the afternoon before on Sunday and met many of the other speakers and attendees at Brotzeit Raffles City (with its own fabulous “garnish farm” greenroof over it), a popular German Bier Bar & Restaurant, where we obviously drank beer (kind of expensive at about $14 each). So this wonderful experience at the Botanic Garden was our first full evening in Singapore with dinner. Well, you can imagine our surprise (ignorance, I suppose) on the following evening when we found out that the cheapest bottle of wine in any restaurant was about $60! We found out that all alcohol is highly taxed here, and the extra expensive prices were also due to the fact that we were hanging out in the exclusive Orchard Road area (the road which led to former nutmeg plantations). So did we ever have a famous Singapore Sling? This traditional cocktail is a mixture of gin, cherry liqueur, grenadine, pineapple and lemon juice, very tropical-like, and of course we had to try one – but at about $16 a pop, we only had one each! The 150-meter infinity swimming pool is the world’s largest outdoor pool at this height. We were pleased to finally meet David Aponte, Founder of PR Green Design, who we’ve been corresponding with about his many projects in Puerto Rico who asked “Are All Green Roofs Created Equal? Green Roof Installation in the Caribbean Region” and then compared similarities between his area of the sub-tropical world to tropical Singapore. David’s seen above between an attendee from The Netherlands, left, (forgot her name!) and Sidonie Carpenter, right, of Australia. Dr. Tan Puay Yok, Deputy Director of the Centre for Urban Greenery and Ecology, National Parks Board presented “The Greening of the Highrise Environment in Singapore: An Overview of Policy and Projects” which was extremely interesting in its scope (read Wolfgang Ansel’s and his October 2010 Guest Feature about the Skyrise Conference here). And the always affable Ho Wan Weng, IGRA Singapore Representative (whom we had met previously in Nurtingen, Germany – read my October 2004 Sky Gardens ~ Travels in Landscape Architecture column about it), talked about the “Sustainable Green Roof in Tropical Asia – Beyond the Horizon. And “A Hospital Within a Healing Garden – Khoo Teck Puat Hospital in Singapore” (above) was extremely enjoyable, too, in particular due to the delightful speaker, Mr. Liak Teng Lit, CEO of Alexandra Health, who manages the hospital. He’s not your typical CEO – he’s very hands on and proud of all his employees – and had us laughing, too. 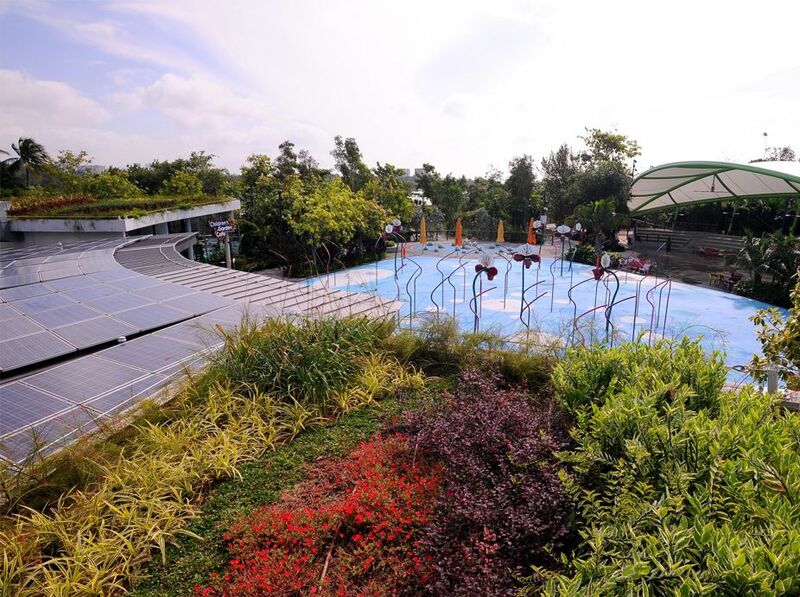 Designed by CPG Consultants, Peridian Asia, and Tropical Environment, the lovely Khoo Teck Puat Hospital project won the First Prize for the SIA-NParks Skyrise Greenery Awards 2010. Rooftop garden spaces were designed to promote patient healing in weaving, terraced levels, and all of the staff was involved in the entire process. Andrew Grant, President of Grant Associates, presented the stunning “Gardens by the Bay, Singapore,” another wow project. Designed by Grant Associates and Wilkinson Eyre Architects, three distinct, orchid-shape (the country’s national flower) waterfront botanical gardens are being set here on 10 hectares. Noted for its “Supertrees,” 18 vertical gardens rising from 25, 40 and 55 meters above ground will power the conservatories and act as energy centers for solar hot water heaters and solar panels, plus provide rainwater harvesting. This project was listed in our Top 10 List as an example of the #3 position,“Biomimicry as Eco-literacy and Holistic Design.” Phase 1 of the Gardens is scheduled to be completed in November, 2011. We visited the site – under construction above – on our tour (I took the photo from the SkyPark at the Marina Sands), and you can see how far they’ve come with the conservatories. See all those columns? Those will be the Supertrees, shown to the right in the photo above, and in the graphic below at night when the canopies will come alive in Marina South Gardens with lighting and projected media (also on the cover of our PowerPoint, above). They will be planted with tropical climbers, epiphytes, and ferns and are sure to create quite a visually stunning display! We also enjoyed hearing – and seeing once again – from perennial favorites Wolfgang Ansel, Director of IGRA (“Green Roof Policies – An International Review of Current Practices and Future Trends”); Susan Weiler, Landscape Architect with Olin Partnership (“A Land Ethic: Replenishing Our Diminishing Resources”); Sidonie Carpenter, President of Green Roofs Australia Inc. and Principal of Green Canopy Design, Australia (“Green Roof and Wall Trends and Projects in Australia”); Professor Hitesh Doshi of Ryerson University, in Toronto (“The Toronto Green Roof Bylaw and the Green Roof Construction Standard”) and Dr. Nigel Dunnett, Director of the Green Roof Centre at the University of Sheffield (“Integrating People and Nature: Sustainable Green Roofs and Roof Gardens”), seen at right. It’s impossible to mention everyone, but you can see the Programme Details here to see all the wonderful presenters and their topics. By the way, the sturdy Conference Programme was highly informative and is a great keepsake of the event, with biographies, many photos and resources. The beautiful, full-color glossy 104-page Issue #2/2011 with The Solaris by Dr. Ken Yeang on the cover (and with my “The International Greenroof Industry’s Online Information Portal: Greenroofs.com” article inside) was included in all the registrants’ bags. In the Conference Closing, Friends of the High Line received the International Green Roof Association (IGRA) “Green Roof Leadership Award 2010,” presented to Dr. John H. Alschuler, Jr. of HR & A Advisors, Inc. (who also had an amazing, inspirational presentation on the subject), by IGRA President Roland Appl for the wonderful High Line project (see the 11.9.10 press release). We all went on our way, and then the entire third day was devoted to the excellent bus tour, which I’ll talk about in detail at another time. The day after the tour, Aramis and I hopped aboard the highly efficient public rail transit system, MRT, to explore the island a bit, and in particular my quest involved having to see the beautiful School of Art, Design and Media at Nanyang Technological University – whose stunning photos have been circulating the Web now for a few years (and we had in the 2008 Top 10 List of Hot Trends in Greenroof Design under “Cool Green Schools of Higher Education”). Next on our self-guided tour was the Suburu Showroom, which we had included in our very first Top 10 List in 2007, under the #9 category of “Sports & Recreation in Unexpected Places.” Unexpected indeed, the rugged yet lushly planted intensive greenroof sits atop the dealership and is the area for test driving SUV’s and off-road vehicles! We concluded our long day of searching for greenroofs at the highly recommended Night Safari– a unique experience as the world’s first wildlife park built for night visits. We rode through the park on a tram that took us through dark but scenic landscapes teeming with nocturnal animals – many of whom I’m sorry to say that you couldn’t see very well! We saw more when we tracked back along the walking trails, though. The Night Safari’s cultural performance was pretty spectacular, with lots of fire-breathing antics. It was definitely worth the far-out visit. I’ll briefly mention the fantastic Walking Tour that The International Skyrise Greenery Conference organizers put together (more later): Thirteen really outstanding projects were mapped and routed for us, along with a brief description or each. We only made it to about six or seven (two were included on the all day tour), and actually found a few more “random greenery” sites of our own along the way! All in all, Singapore was a trip of a lifetime – of course, we are fortunate to travel extensively. This world-class conference was one of those unique opportunities to combine a working vacation with a world-class city. Aramis and I have wonderful memories of the cosmopolitan city that is Singapore, and will surely return here, most probably when the incredibly stunning Gardens by the Bay at Marina South is finished. And I want to fully explore the Singapore Botanic Gardens at my leisure, too! Singapore is evolving from “The Garden City” into a “City Within a Garden,” much more a philosophy of a way of living as opposed to simply a coveted title. I think it’s safe for me to say that urban greenery innovations are growing almost daily here, literally! And their continued promotion of green initiatives will help strengthen Singapore’s distinct identity as a tropical City-in-a-Garden. That’s it for now, I’ll be blogging about all our stops on the tour soon. But for now, reflections on the cooler climate of the gorgeous city of Vancouver, B.C. are next! ~ Happy Greening, Linda V.
18 replies to "Reflections of Fall 2010 Greenroof Conferences: Singapore, Part 2"
Sky Gardens » Blog Archive » Enter the International Skyrise Greenery Awards 2011 by July 25! Sky Gardens » Blog Archive » Greenroofs & Walls of the Worldâ„¢ Virtual Summit 2011 Episode 12: Wind. Water. Heat. Grow. Greenroofs.